We have all been there, you go out scouting a location only to find that in the middle of the night the Milky Way doesn't line up where you thought it would. Yes, I know there are a lot of mobile apps out there but they all work in real time which makes planning kind of difficult. I have found that Google Earth does a great job of showing you where the milky Way will be. 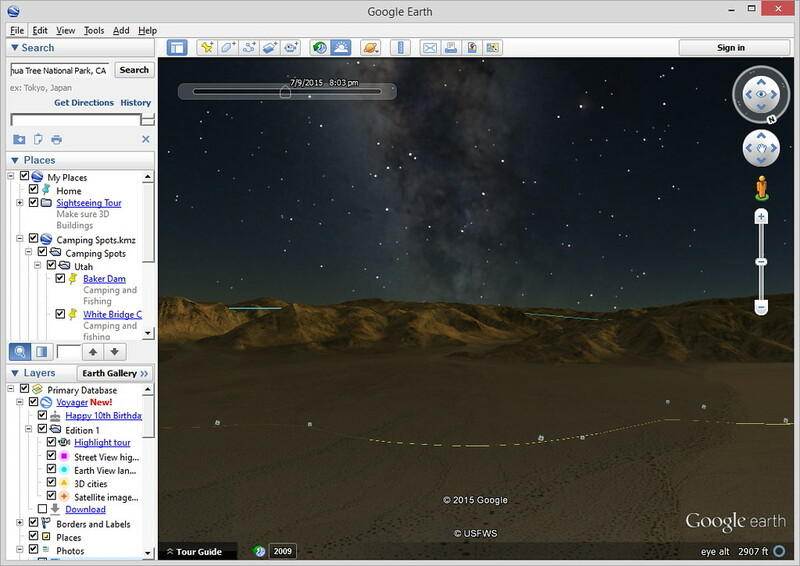 Google Earth gives you the ability to select a date an time, either in the future or past, this allows you to see exactly where the Milky Way will make its appearance. As you can see from the slider in the top right, I have selected 7/9/2015 at 8:03 pm and now I know where the milky way will be. There is however one caveat, even though Google Earth does a great job on location it falls short on lighting, I have found on many occasions where Google Earth will show it being dark where in reality it was still pretty light outside. I hope this tutorial makes someones life a little easier. Till later, have fun chasing that Galaxy.